“good junk” to a worthy cause. Volunteers will be setting out and pricing items between 10am and 2pm, but you may bring your special treasures anytime on Wednesday & Thursday. Sherry French at 928-339-4331 to schedule drop-off. WE HOPE TO SEE YOU…! 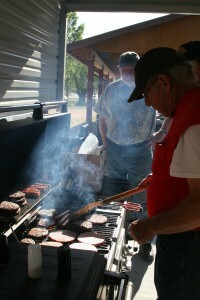 Annual BBQ & Dance are used to fund improvements to the Nutrioso Community Center; and to sponsor other community gatherings & events, a college scholarship and various charitable donations throughout the year. Board meetings are held at the Nutrioso Community Center and are open to all community members. The NCA would love to see you at our May gathering to welcome all of our seasonal residents back to Nutrioso for another beautiful summer in the pines. COME MEET NEW NEIGHBORS & VISIT WITH OLD FRIENDS! Drop off dates for baked items will be posted in June. The NCA will provide ham, turkey & beef. Bring your favorite side dishes, salads or desserts. If you would like to coordinate your dish, contact Sherry French at 339-4331 or Sandi Springhower at 339-4462. A fun gift exchange will follow dinner! Bring a wrapped gift (valued $20 or less) to participate. Friday, June 23th and Saturday, June 24th. Stage 1 Fire Restrictions Begin Monday, April 23 at 1:00 a.m.